Rich Text fields are textarea fields that use the WordPress rich text editor. This allows user to easily add bold text, links, ordered lists, blockquotes, etc. 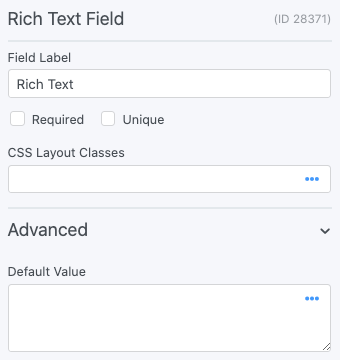 You may add a default value to a Rich Text field by typing the value into the field on the form builder page. Display the value submitted in a Rich Text field in a form's confirmation message, email, or View. Replace x with the ID or key of the Rich Text field. Truncate: Truncates text to the specified number of characters. By default, a link is appended to the end of the text. You can use the following parameters to modify or remove this link. Replace x with the ID or key of the Rich Text field and replace '40' with the number of characters you would like to display. More text: By default, this link will be "..." but can be changed with the parameter below. If this shortcode is inserted in a Dynamic View, the link will go to the detail page. Otherwise, it will show the full text in-place. Replace x with the ID or key of the Rich Text field and replace '100' with the number of characters you would like to display. Remove links: Remove links from text. Remove HTML: Removes all HTML from the displayed text. Change the options for the TinyMCE editor, like having an Add Media button, with the frm_rte_options hook.